Summary: Lenah Beaudonte should be dead. But having sacrificed herself to save another, she finds herself awakening with strange powers that are neither vampire nor human—and a new enemy on her trail. In her vampire life, Lenah had thought that being human was all she ever wanted; but the human heart suffers pain, heartbreak and loss. Review: Vampire books are always a favorite of mine, so when this book showed up for review, I couldn't wait to get into it. I was a little skeptical over the fact that this is actually the second book in the Vampire Queen series and I hadn't read the first, but I decided to dive right in and see where the story would take me! Lenah used to be the most powerful vampire- the Vampire Queen. But now, after the love of her life performed a dangerous ritual, she's a human. Being a human comes with things she hasn't had to deal with in over 500 years, like the ability to actually feel. The only problem, though, is that Rhode, the one who saved her, seems intent on staying away. Not to mention one of the vampires she made is hunting her and her classmates at the boarding school she attends. Can Lenah stop this powerful vampire when she's merely a human before it's too late? A couple of chapters into this book, I realized I had missed A LOT in the first book. While it was pretty easy to piece things together, there was still a lot of details that I really wish I had known going in, like what happened with the whole ritual thing and how Tony had died. So I just want to say this first that I would DEFINITELY recommend reading the first book in the series before this one. You'll get so much more out of this story! Now looking back at this book, I still thought it was pretty good. Lenah sometimes got annoying with her whole being with Justin but imaging he was Rhode. Other than that, though, I liked how she was learning to be human and understanding what a monster she was as a vampire. Vicken, her friend, is such an awesome person and he was probably my favorite character in the entire book. His sassy attitude was just the right thing to keep Lenah in line (well, as in line as she would let him). There was a ton of suspense and mystery that kept you on the edge of your seat the entire book. The paranormal aspect was really good, especially when they added in spells and magic on top of the vampires. There were just so many elements that added up to making this story one you couldn't put down. 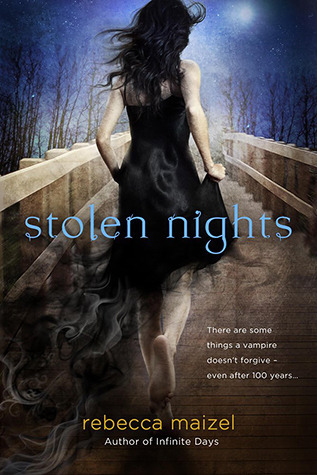 Overall, Stolen Nights was a pretty good read on it's own, but I imagine it being awesome to those who have already started the series. So once you've picked up the first book, definitely pick this one up next! You'll find yourself immersed in a paranormal world of power hungry vampires and an intense romance that seems to cause more hurt and misery than anyone, even a murderous vampire, deserves. This does sound really good, with spells and vampires and magic! Right up my alley. Glad you were able to enjoy it even though it was a second in a series----it's great when a book can stand (mostly) on it's own!